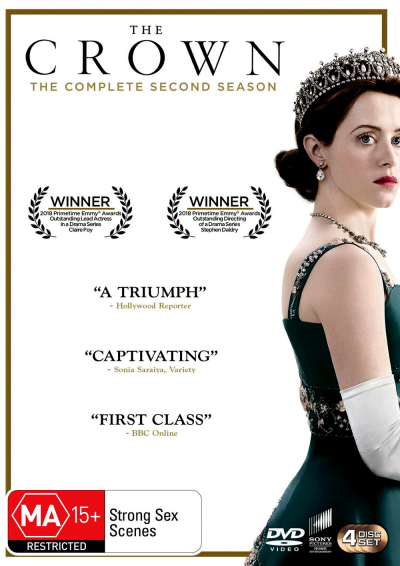 The Crown season 2 DVD sees Claire Foy return as a young Queen Elizabeth II. After the first season wowed audiences with its beautifully composed shots, stunning art direction and incredible performances, season two goes even further and is simply amazing. The Crown series 2 DVD is probably the final season with Claire Foy as Queen Elizabeth 2 before she hands over the role to another actress to play the Queen's older years. Follow Queen Elizabeth through the late 1950's and early '60's as she struggles to navigate a world that's changing around her. She must face the challenges of a new era, from the Suez Canal crisis to the assassination of John F. Kennedy, while preserving both the monarchy and her marriage. Click the button below to add the The Crown - Complete Season 2 to your wish list.